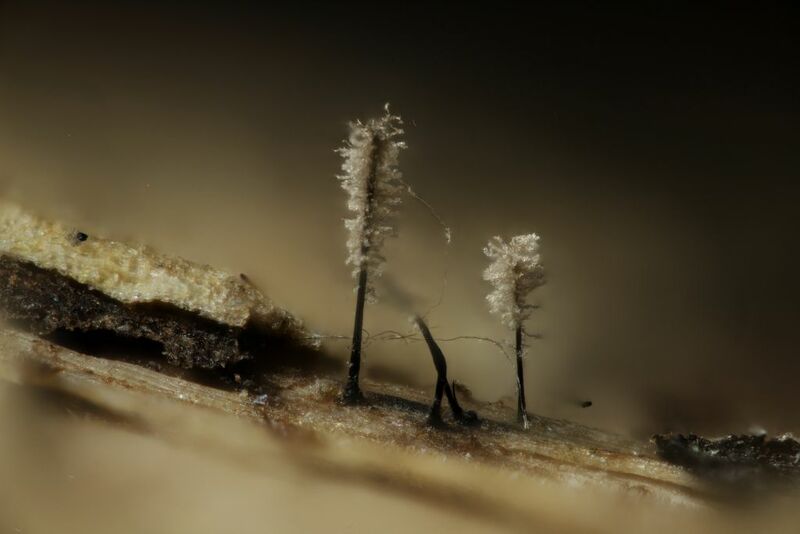 www.photomacrography.net :: View topic - Microfungi setup - which tube lens? What step size would you normally use at 20x? I've been using 5 um and end up stacking about 30-40 shots. Would there be any disadvantage in going down to 2um apart from storage and time? I'd like them to be as sharp as possible and show as much detail as possible. DO try 2-2.5µm, you should see a slight improvement if you look hard. How dark should the room be? I have curtains and blinds drawn, but there is some light from the computer screen. Are you using flash at the end of an extended exposure (2 seconds?) to be free of shutter vibrations? Try a 4 second exposure without the flash. If there's nowt to see, no worries! I have noticed that if I do a larger stack through more of the depth of the image, then objects appear flattened. Is this normal, or is it something that I'm doing? Try turning off the Scale option in Zerene's Setup. The view you have is fairly telecentric so you don't get much perspective. Then it's "just" lighting - the hardest thing. A second, low power slave flash may help. What's the best way to blend between the focused area and the unfocused area? An adjustable iris interposed right behind the objective. 52mm (eg jinfinance on ebay) so it'll NOT need adapters. I expect you could make a little black paper "hat" to slide over the objective very carefully, to create a small aperture. One frame will do if all you want is to make the foreground and background less out-of-focus. Stack it separately with all possible scale etc setting enabled, and be prepared to retouch a lot - objects will move! You'll need to turn the flash up, or combine several frames exposure-wise. I've never tried the latter-you'd need zero movements I guess. If you can get 3 stops brighter flash for the reduced aperture shot, that should do. Of course you can do more stopped-down steps. Looks like you are already putting it to good use!! The DoF for the Mitutoyo 20x (0.42 NA) is ~3 microns from my notes, based upon DoF ~ lambda/(NA^2), lambda ~0.55 microns for green. I really like how the Stackshot works being controlled from Zerene also, this is my favorite method for focus rail control. You can also control other focus rails from Zerene with the Stackshot controller, the Wemacro and MJKZZ focus rails work perfectly with this method. All you need is the proper adapter cable for the focus rail motor and proper parameters for the rail (screw pitch & motor steps). I see you have the Wemacro Vertical Stand, this is another nice item for us macro folks!! The newly offered horizontal kit mod for the Vertical Stand works splendidly if you want to use the Vertical Stand in horizontal mode also. BTW I have and use the Nikon 200mm F4 "Q" lens for a "tube lens". This is similar (older) to your Ai version I believe. I had an issue that caused my longer stacks to get messed up, eventually I traced it the the focus ring on the Nikon. In vertical orientation the weight of the lens and Mitutoyo was "pulling" the lens slightly away from infinite focus, and also creeping over time. One simple solution was to heavily tape the focus ring at infinite focus to keep it from moving. I may end up gluing the ring in place, since I only use this lens as a tube lens. No. I haven't tried that yet. Will do. I just tried turning the Scale option off. Didn't see much change. I'll play around more with lighting to see what works. I must admit that it's a lot of fun playing with lighting and seeing it's effect. I'll try making a soft box and see what effect that has, then look at a second, small flash. It's one of the reasons for going with the Canon transmitter. I can really easily add another flash and work them wirelessly. This sounds really complicated. I was hoping for a quick adjustment in Photoshop. I'll put this bit on hold and deal with lighting etc first. Mike, I'm also really liking the ease of setup using Zerene controlling the Stackshot etc. It's incredibly easy. Good to know! Thanks. I'm happy with vertical at the moment, but good to know that there is an easy conversion. I haven't noticed that problem with the Nikon lens. I'll keep an eye on it. So I've now got second curtain sync (SCS) working. The Canon Transmitter ST-E3-RT wouldn't allow SCS or even manual mode to work on my Speedlight. So I bought a YongNuo YN622CII transceiver duo and they work well. Things like this in the image below are probably my most challenging subject with lots of fluffy white/translucent bits. Any advice on improving this image? Would adding a second, smaller flash improve things or make them worse? I'm hoping to add in a bit more detail at the base of the stalks. This was taken at 3um steps, 1/8 flash, F5.6 (set manually on lens), ISO100, 2 second exposure with flash at end (SCS). edited: Wow the image here looks a lot worse than the one on my desktop. Any idea why that would be? I resized it to 1024 before uploading. This is the same setup but with flash set to 1/16. It looks a bit dark to me, but can see more detail. Well, it's not helping that your image file length is only 69 KB. The one in the next post is only 50 KB. The forum permits up to 300 KB per image, which may reveal some additional detail. Other than that, my best guess about the difference from your desktop is that it's a difference between your browser and whatever other image viewing tool you're using. For images that are 1024 pixels or smaller and 300 KB or shorter, the forum software serves back exactly what got uploaded. But then if you're working on a hi-dpi display, your browser is automatically expanding images from whatever their real size is, to some larger scaled size. At this moment, my own monitor is set to a scale factor of 1.75, so your image at 1024x683 is actually displayed as 1792x1196 pixels on my screen. That expansion by the browser is not always great for preserving sharpness. Depending on what browser you're using, you may be able to check this aspect by dragging the image from your desktop into the browser, bypassing the forum entirely. The last issue is that very small subjects like this can and should be sharpened aggressively, because they have been softened so much by diffraction. At 20X and NA 0.42, that lens is effective f/24 back at the sensor. The images that you have uploaded have been compressed so much that I don't want to use them for demonstration, but as a wild guess I would suggest filtering with Unsharp Mask in Photoshop at 100-150% with a radius of 0.7 pixels in this 1024 size. I'll try uploading a new one that I've exported as 1024 pixels and 284kb. I've used unsharp mask (0.7 radius, 100%). I think it did pull up some more detail. I've got both the camera and Stackshot tethered to a Mac. Zerene is controlling the Stackshot. I'm using Canon EOS Utility 3 to control the camera. I'm still playing around with it, but these are some of my first shots. They're probably not terribly exciting to anyone else, but I'm getting pretty excited because they're far better than I've been able to get using a dissecting microscope. 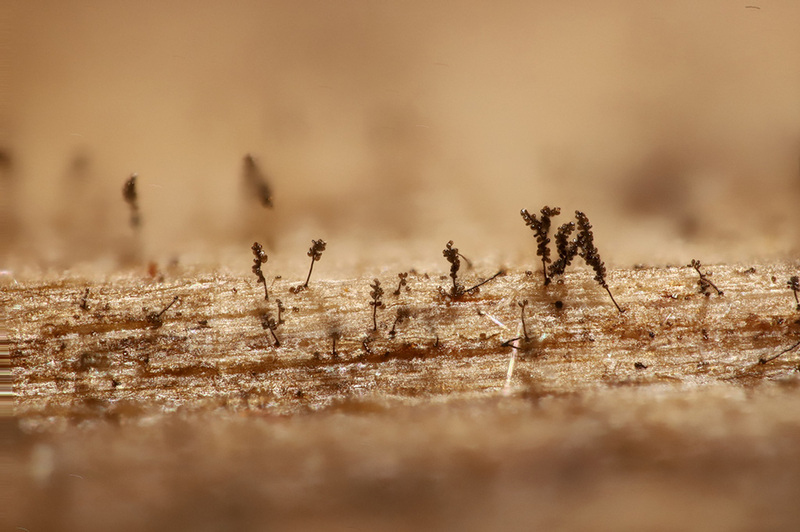 These are fungi on wood. I've just got a few questions. Thanks. Still playing around with the setup. 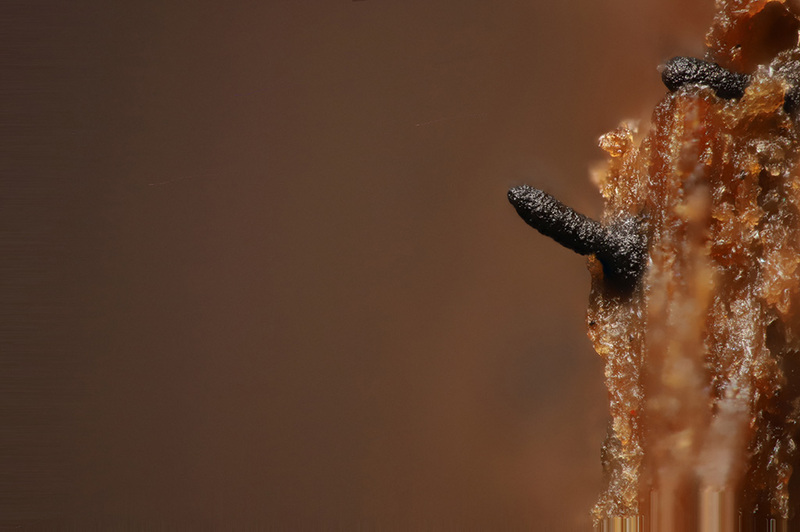 Good luck with getting images of plant pathogenic fungi. 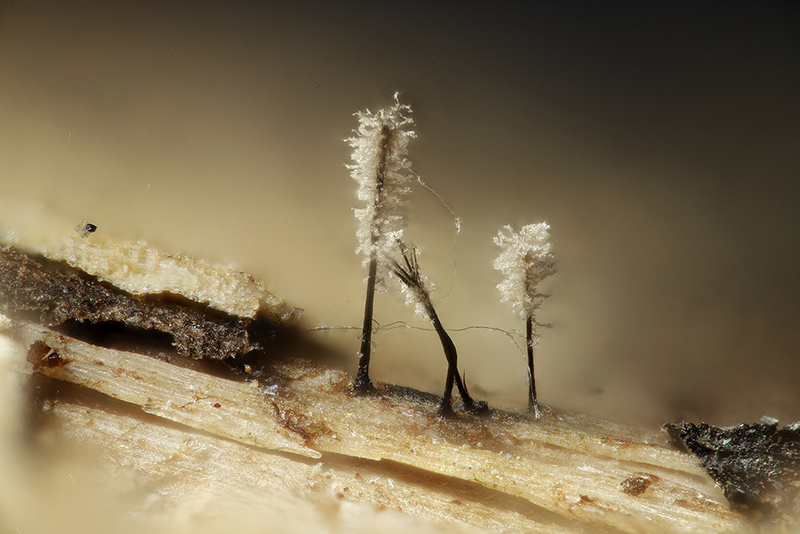 We need far better images of micro fungi!